I’ve been critical of President Obama’s policies concerning science, technology and education in the past. I think he uses a lot of great-sounding rhetoric, but I have yet to see very much in the way of actual results. Despite lofty promises about climate change, we remain without a cap-and-trade system or any sort of meaningful response plan. To make things worse, the administration recently fired their primary adviser for climate change policy. Is all hope lost? Perhaps not. Last week’s “State of the Union” featured a nearly-unprecedented focus on science, technology, and education, and as usual I like the ideas he proposed and was impressed by his speaking ability (though the use of the tagline “winning the future” was peculiar, given that it was the title of a 2005 book by likely 2012 Republican Presidential Candidate Newt Gingrich) . He announced goals to modernize U.S. transportation via high speed rail, to increase broadband internet access, and to encourage more people to become teachers. If these turn into tangible results I’ll be a happy scientist. One aspect of his speech has caused a small uproar among some environmentalists, and I expect it to make for an interesting ethical debate. A main focus of the speech was a push for clean energy, something that’s pretty high on the wish list of the environmental movement. He correctly pointed out that we are falling behind other countries in this regard. He correctly pointed out that past government investments in R & D (the space race, the internet, etc.) have resulted in enormous economic gains for the nation. He correctly pointed out that no one alternative energy source is a simple fix for our oil-based economy, and that we will instead need a mix of all of them. Some are upset by this strategy, claiming that it represents a surrender on the most important environmental issue of our time and that a major restructuring of our economy (such as a cap-and-trade policy) is the only way to fight climate change. Others believe that increased investment on clean energy is a good thing regardless of the political tactics that bring it about. They point out that with the current Republican House majority, a perfect climate policy is impossible and that this is the best we can do. For the purpose of the debate, let’s simplify and claim that the ideal climate policy is in fact cap-and-trade (something that is, in reality, hotly debated by environmentalists). The question for this ethical debate is simple. Would you rather have the U.S. government invest in clean energy while doing nothing to restrict CO2 emissions (the “better than nothing” policy President Obama proposed in the State of the Union), or would you prefer that we try to fight a likely-unwinnable battle for a perfect solution to climate change? Ethical debate: Can an endangered species be a business partner? Ethical debate: saving owls by killing owls? Though climate change is an important issue, I feel that if Obama cited that as the primary reason for our energy renaissance, it would just fuel further debate and polarization. Many of us know we need to transition to sustainable energies simply because fossil fuels are finite, and our dependence on them is an increasing threat to national security and our economy. Let’s get building! I feel this is emblematic of Obama’s presidency to date. I don’t mean the discrepancy between the rhetoric and policy (or lack thereof), I mean what seems to be the gulf between what is good policy and what we must settle for. I’m in favor of far more ambitious, some might say aggressive, policy regarding clean energy and climate change, but is that even possible, given our current situation in Washington? It’s depressing, but sometimes I think maybe Obama is doing everything humanly possible for health care, the environment, human rights, etc., and the lukewarm (at best) policy results might just be the best outcome possible. Hope I’m wrong! I would rather have the U.S. government invest in clean energy. when clean energy is used by more and more people, it makes an impact. The people will see that using clean energy makes an impact on the economy. I feel that after time of seeing the positive results, the population will then worry about the CO2 emissions. Each step is a small amount of progress in creating a better economy. Does investing in clean energy not aim for a solution to climate change? If we are to actually make the investment and have our nation switch to clean energy sources, ultimately we will solve our climate change issues to some extent. So doing one will fix (or at least benefit) the other. But, I wonder how this switch will be done. It is true that our nation is extremely oil based and there are many people who are stubborn when it comes to change, that even if it benefits them and the world, they will not want to switch to clean energy. I feel that the president may underestimate the difficulty he will face in switching many major companies over to clean energy resources despite the fact of how necessary it is. Many regions of the U.S. profit off of the resources that we are depleting and will protest any kind of change as detrimental to society and the welfare of their economy. Will Obama have to find a way so these people profit off of the clean energy resources to get them to change? Has he thought about that? Also, these unrenewable resources we are dependent on are being depleted at such an alarming rate as our population continues to grow. I wonder how quickly a change to clean energy can be made, and if we’ve already passed the point to where a change would even matter in respect to our already massive carbon footprint. Although a perfect solution to climate change is the ideal solution it is important that the government take immediate action to attempt to help the climate change. With the House being ruled by Republicans it is obvious that the perfect solution would probably not be successfully passed and would result in a lot of time being spent on fighting over the correct solution. Therefore, even if Obama’s push for clean energy is not aggressive as some would hope it is better than nothing. However, it is important that it is followed up with efforts to keep helping our environment and not just considered to be as good as its going to get. The push for clean energy is a step in the right direction. 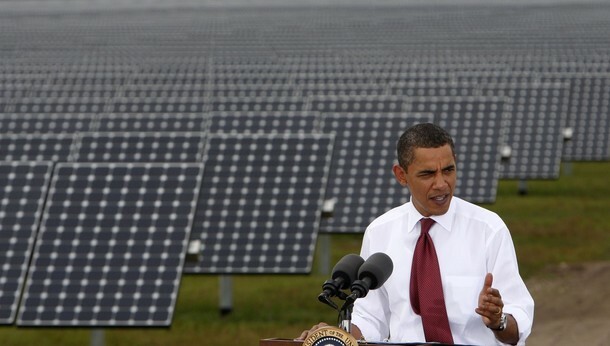 The greatest obstacle in swaying people towards clean energy is showing how it will directly impact or benefit them in the long run, and that’s why it appears Obama cites improvement to economy as a main motivator for clean energy. The issue of climate change is too big a problem to realistically expect immediate results. If Obama can effectively introduce and promote these new sources of clean energy, then we could start to gradually integrate a cross over. Providing incentives to those who decided to jump on the clean energy bandwagon could also gather more immediate results, such as Obama’s previous “Cash for Clunkers” deal. Efforts to significantly reduce CO2 emissions just aren’t very plausible; we need to ease people into the transition. We should tackle this problem one step at a time. The fact that clean energy was the primary topic in the State of the Union address speaks volumes on its importance as far as policy goes. It seems to me that many people who are concerned with clean energy and the environment already know that they go hand in hand with climate change. People do agree that there is a need for alternative energy, but those same people disagree as to why. As opposed to starting a debate about why we need clean energy, the President instead told us the ideas that are realistically being circulated, and the fact that the administration knows that there is not a single or simple fix to the problem. The American people do not want to give up their SUV’s and cheap energy and they certainly won’t if there aren’t ready alternatives. The State of the Union may have sounded like the same old rhetoric to some, but as long as the “brass tacks” of clean energy are the topic of conversation, I’d say we are at least on the right track.